We are excited to share this great site with our readers! Whether you are trying to stay in fashion with the latest trends on a budget, or buy some great gifts for your friends and family, SassySteals is your site. They provide you with the ability to shop for almost everyone on your holiday list in one place this year! Make sure to check out their awesome deals on cute baby accessories and jewelry. You won’t be disappointed in the variety offered, or the price! 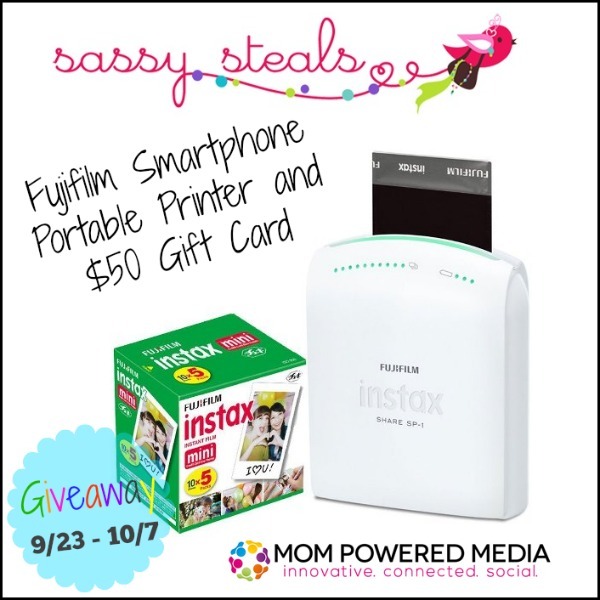 Mom Powered Media is super excited to bring you a great giveaway from SassySteals! We get to give you, our readers, the chance to enter and possibly win this Fujifilm Instax Share Smartphone Portable Printer! This printer is perfect for the on the go amateur photographer with it’s easy Wi-Fi ability to print straight from your smart phone, laptop or tablet! I like the vintage lace boot socks. The infinity scarves are pretty. i love CHEVRON HALLOWEEN DRESS SET! great deal and beautiful out fits! I like the hand-stamped initial necklace…totally cute! I love the Shabby Flower with Matching Headband Deal !!! I love how functional the printer is! I take pictures all the time so I could definitely use it. The Personalized Halloween Buckets are my favorite.